Li Na of China returns a backhand against Caroline Wozniacki of Denmark. 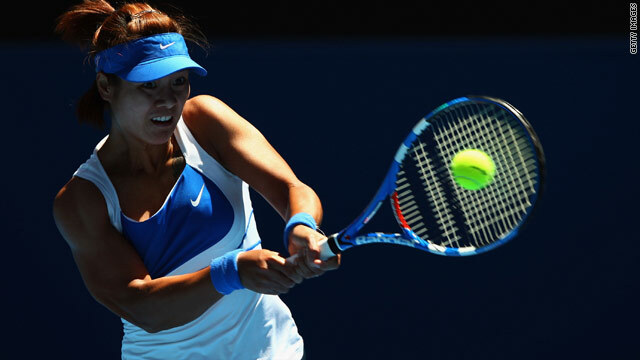 (CNN) -- China's Li Na took down the No. 4 seed Caroline Wozniacki at the Australian Open on Monday in Melbourne, following compatriot Zheng Jie into the quarterfinals -- the first time Chinese women have made it this far in the season's first Grand Slam. Though Li, the No. 16 seed, had 34 unforced errors compared to Wozniacki's 22, she also nailed 21 winners against three for her opponent. She also made 70 percent of her break point conversions as opposed to 42 percent by Wozniacki. "Against her, you need to just play on your highest level the whole match through and keep concentrated and keep a lot of balls in play," Wozniacki told australianopen.com. Of the original top five women's seeds, only No. 1 Serena Williams is still in competition. Her sister, the No. 6 seed Venus, fought off a challenge on Monday from Italy's Francesca Schiavone (17) to advance, 6-3, 6-2, 6-1. Schiavone hit five aces compared to none for Williams, but she also made more unforced errors -- 32 -- as opposed to 29 for her opponent. "She played really well in the first set. I have to give her credit. She just played really aggressively. You know, she was making her shots, doing everything she needed to do to win the match," Williams told australianopen.com. "But, you know, obviously it takes a lot to close out a match, especially on an important match like that one. I was able just to get some footing back in and start to execute the way I wanted to." Williams will face Li Na -- whom she lost to in the Beijing Olympics in 2008. "She's a very good player," Wiliams told the Web site. "Obviously to beat Wozniacki, you have to play very well consistently. I'm sure she did that. Probably will try to do that in the next round." Others in the quarterfinals include former world number one Justine Henin, Maria Kirilenko and Nadia Petrova. Zheng Jie on Sunday became the first Chinese player to make the last eight of the Australian Open by beating Ukraine's Alona Bondarenko 7-6 6-4. She next faces the unseeded Kirilenko, who put out former champion Maria Sharapova in the first round.